You're e-list exclusive offer ends tonight! A huge thanks to you all for your continued support! If you haven't had a chance to check out all the goodies in my shop please do so ASAP so you don't miss out on your 30% off coupon. Right now is probably the biggest selection of original paintings I've had available online in years. There are also A LOT of limited edition prints and a plethora of "functional art" like handmade wallets, keychains, buttons, etc. 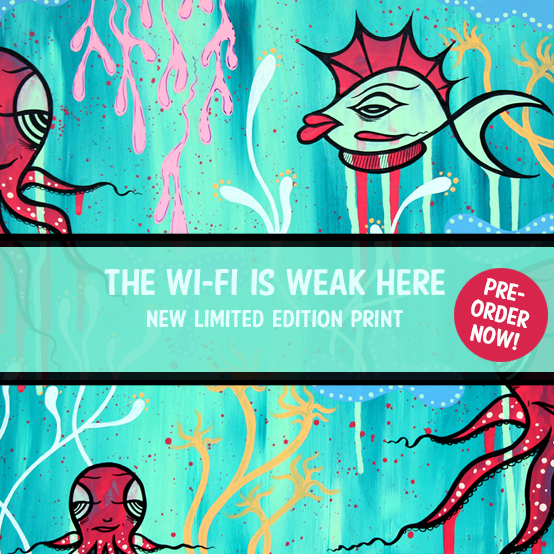 On top of the 30% off for my lovely e-list subscribers I am also offering pre-orders right now on my latest print, "The Wi-Fi Is Weak Here". It's available in two sizes and each one is an edition of 50. The pre-order offer ends on Monday July 13 at 11:59pm. For all the details about this new limited edition please visit jeffclaassen.storenvy.com/search?q=wi-fi+print. I hope you've had a great weekend! It's time for me to get off the computer and blow all the leaves off the roof. Fun stuff!